Pro-Rust Out chemically removes iron and rust build-up that coats the resin beds and fouls the softener. This iron build-up is not totally removed during normal regeneration of a water softener. Using Pro-Rust Out in a water softener will eliminate rust and foreign matter from the resin bed. This increases the life of the softener and reduces rust staining on household fixtures and other surfaces. Use regularly as preventative maintenance to ensure the softening and recharging efficiency of the softeners resin bed. Water Softeners: Pro-Rust Out dissolves the iron in the mineral bed and is rinsed from the softener much the same as salt brine. Preventative Maintenance: Add 1/4 cup for every 40 lbs. of salt added to brine tank. Layer to ensure a continuous dose with each regeneration. General Purpose Cleaning:Dishwashers, dishes, glassware, white clothes or fabrics, and water softeners follow directions on the back of the package. Changes rust and iron into a clear solution that easily rinses away, and does not contain harsh or abrasive chemicals that can damage fiberglass, porcelain or acrylic finishes. 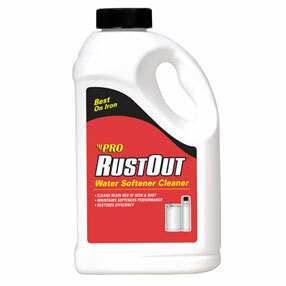 Multipurpose cleaner that out-performs the competition when it comes to removing tough rust stains from toilets, sinks, tubs, white clothes, water softeners and exterior surfaces.Pro-Rust Out s advanced formula contains more than 5 chemicals that are designed to clean and prolong the life of water softeners. Store separately from combustible, organic, or other readily oxidizable reactive materials. Keep covered and store in dry location. Read relevant Material Safety Data Sheet before handling this product.